5/8" x 150' New England 12-strand Treeline Lowering Rope Hank. A tightly braided 12-strand rope that stays round and retains its flexibility and easy handling qualities whether dry or wet. Treeline is designed specifically for the task of lowering limbs and handling arborists equipment. The polypropylene core of each strand is covered by firmly twisted high tenacity polyester fiber yarns to provide extra wear and longer service life. Its unique construction makes it non-rotating and hockle proof. 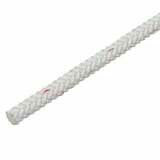 Very low stretch, high strength, excellent knot holding ability and offers superior load control.